I found when reading a book from my friend David Nihill called "Do You Talk Funny? 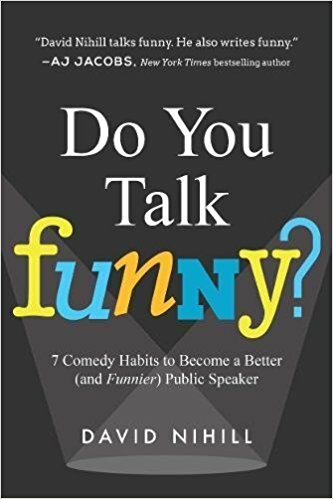 :7 Comedy Habits to Become a Better (and Funnier) Public Speaker" there were lots of learnings. Not just learnings, but actually simple things I've been able to put into practice when presenting. For example, I'm even more conscious of the rule of three, using stories and reconstructing sentences to leave the final word in a sentence as the real punchline. Along with opening your eyes to some invaluable insights into how comedians work, there are some excellent stories intertwined with gems of wisdom. I do highly recommend it. In what doesn’t sound like the best plan ever, David decided to overcome his fears by pretending to be an accomplished comedian called "Irish Dave" for one full year, crashing as many comedy clubs, festivals, and shows as possible. One part of the plan was at least logical: he was already Irish and already called Dave.